"The law of life is change and each generation leaves its mark..."
Long before this village in the Catskills adopted the name of one of its foremost residents and prospered as the resort colony of Fleischmanns, it thrived as the rural community of Griffin Corners. In those days, the abundant water supply powered the sawmills, gristmills and factories; the forested mountains supplied timber; and the hillsides, though rocky, provided pasture land. But even before Matthew Griffin established his bustling corner of commercial enterprise, men conspired to reap their fortunes in this rugged Catskills landscape. In 1708, Britain's Queen Anne had granted 1,500,000 acres of New York land, which included most of the Catskills, to seven men headed by Kingston merchant Johannis Hardenburgh This was the Hardenburgh or "Great" Patent. At that time, being lord of the Catskills was a dubious distinction since Indian trails and rivers were the only means of penetration into the densely forested mountains. Yet Hardenburgh would spend the rest of life defending his patent while speculators schemed to get the land surveyed and settled. In 1740, Ebenezer Wooster ventured up the East Branch to survey the Hardenburgh tract, paving the way for Robert Livingston, who came three years later to examine the land that bordered the Esopus River from Shandaken to Pine Hill and around Pakatakan, an Indian village near what is now Arkville. Buying up huge tracts of land "dirt cheap," Livingston eventually controlled over two-thirds of what is now Delaware County. Later, General Henry Armstrong came to own the 8,000 acres of land that encompassed what is now Fleischmanns. Early settlers came from Holland, Germany, England, and Ireland. In 1797, Delaware County split off from Ulster and Tryon Counties. By 1800, the county's population numbered over 10,000. During the next ten years, the population doubled. Vast tracts of land in New York State continued to be owned by individuals who subdivided their holdings into plots for farms. While tenant farmers labored to clear and improve the land, the chances of ever owning their own farms were slim. The farmers found themselves trapped by the same landlord system that had oppressed them in Europe. Meanwhile, the land owners dreaded that Great Britain might levy a land tax, an expense that would force them to divest their vast holdings. As the Revolutionary War loomed, landlords sought to rally their tenant farmers by extolling the virtues of independence, while King George's men promised to overthrow the landlords and grant each loyalist his own farm. The victory of the colonialists did little to improve the lot of the Catskills' tenant farmers, and resentment toward the landholders continued to fester from one generation to the next. The Anti-Rent War, an uprising of tenant farmers in 1844-1845, led to reforms which put an end to the unfair lease system and the area began to grow under private ownership. To reach this mountainous place, the intrepid traveler journeyed by horse and wagon or stagecoach, , over rough, dusty roads in summer and rutted, muddy paths in winter. Eventually, the road was resurfaced with planks from Kingston to Pine Hill. But it was still a difficult journey until the railroad reached the village on May 23, 1870. In 1885, Inspector Charles F. Carpenter wrote a report for the New York State Forest Commission that documented the railroad's impact on the Catskills. Before the arrival of railroads, the Old Catskill Mountain House near the Hudson River was frequented by the aristocracy of New York and Baltimore while the rest of the region, said Carpenter, was known only to fishermen, farmers, and woodcutters. With the railroad's steady advance, the entire region had become "the natural picnic ground of the vast population of New York and vicinity, " he reported. While the wealthy purchased land to build their own estates, enterprising immigrants opened hotels. For each and every ethnic group or religious persuasion, there would be a haven in the Catskills, a place where the food, the language and the social customs would make folks feel at home. Fleischmanns began to flourish as a boarding colony with the ease of travel offered by the Ulster & Delaware line. In 1883, Charles F. Fleischmanns purchased property west of the village near the Ulster & Delaware railroad station. The land was purchased from John Blish, who then became its superintendent. Soon family members built beautiful summer homes. They also constructed a deer park, a riding stable, a heated pool filled with spring water, and a trout pond, all luxuries unheard of by the people in this valley. From 1890 to 1912, the present community went by two separate names. From the east end of the village to Division Street (now Bridge Street) was Griffin Corners and from . When the village incorporated in 1913, it became Fleischmanns. Fleischmanns Park, which dominates the north side of Wagner Avenue was a gift to the village in May 1914 from Julius Fleischmann, son of Charles. Among the many interests of the Fleischmann family was major league baseball. The park, formerly know as the Mountain Athletic Club, was where their players came to get in shape before the start of the regular seasons. One player, in particular, stood out: Peter Honus Wagner, known by his fans as the Flying Dutchman. He was admitted to the Baseball Hall of Fame in 1936. Wagner Avenue bears his name. Many rich and famous people built summer homes in Fleischmanns over the years, among them Herbert Lehman, governor of New York, and the Leibman family, owners of Leibman Brewery. At nearby Highmount, soprano Amelita Galli Curci and Shakespearean actress Julia Marlowe built estates. Fleischmanns was also home to the beloved Molly Goldberg (Gertrude Berg) of radio and early television. As the railroad and later the motor car made transportation increasingly affordable and convenient, Fleischmanns abundant supply of fresh mountain air, pure spring water and beautiful scenery offered a popular retreat. A building boom produced accommodations for all levels of income, from grand hotels to bungalow and farmhouse lodgings. "No summer resort in the United States had a more rapid growth in the last two years," a 1922 newspaper article in the Catskill Mountain News reported. "Property that was worth 00 a short time ago is now worth ,000…A hotel that was worth ,000 is now selling for twice or thrice that sum…" Noting the construction of 50 new bungalows and 14 new houses, the article concluded, "Fleischmanns is about to become one of the great summer resorts of the country." The boarding season generally got in full swing with the July 4th holiday weekend when practically all of New York City made a mad dash for the Catskills, filling lodgings to capacity. 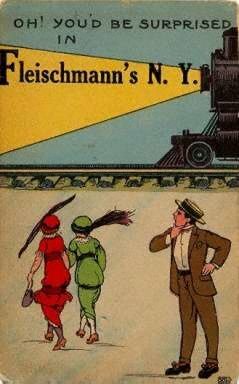 Women and children often spent their entire summer in Fleischmanns, and at the end of each work week, "husband trains" transported businessmen from New York City to join their families for the weekend. In its heyday, well over 100 hotels and boarding houses thrived in the Fleischmanns area. Old timers can still recall when Fleischmanns permanent population was 500, but by the Fourth of July, there could be 10,000 in the town, with a continuous traffic jam on Main Street. People fondly recall the elegant hotel dining rooms and the many amusements, from casinos and bowling alleys to live entertainment. During the boarding season, comedians, opera singers, orchestras and dance bands filled the nights with culture, gaiety and romance. The local economy was directly and indirectly bolstered by the tourist trade. Farmers raised fresh produce for the hotels and took in boarders, while merchants offered an assortment of goods and services from the finest luxury items to ice cream and soda. The 1940 Business Directory of Fleischmanns Community, sponsored by the Methodist Church, reflected the town’s civic pride: "Municipal government of the village has been the most progressive in this part of the state, and at present has the most modern fire fighting equipment… Its municipal water works is beyond comparison..." The brochure also mentioned the Skene Memorial Library with nearly 5,000 books and "all the leading magazines," as well as the Fleischmanns-Pine Hill Rotary Club, organized in 1938. The Fleischmanns synagogue was recognized as "one of the finest buildings of public worship in this country." Funds for its construction were raised by the Jewish Farmers Association, which incorporated the Congregation in 1918. In promoting the fundraising effort, benefit performances were given by New York actors who contributed their services. Tourists first came to the Catskills to escape the stifling heat of summer. People suffering from respiratory illnesses were prescribed a diet of fresh mountain air, the higher the altitude, the better. The sparkling spring water was touted as an elixir for all ailments. Hunting and fishing lodges appealed to the sportsmen. Later, hotel owners introduced winter activities: ice skating, sleigh rides, tobogganing, and eventually, skiing. But there was more to Fleischmanns than just hotels. Once the railroad linked the village with major transportation arteries, the village was to grow both in reputation and infrastructure. Lake Switzerland was built for boating and swimming, as well as the harvesting of ice. Construction was started in 1906, using teams of horses and oxen for power. The official opening was just one year later. The harvesting of ice made it possible to refrigerate milk, butter and cheese, and railway milk cars connected to the "milkmaid boat" at Rondout to travel down the Hudson River to New York City. At the turn of the century, the dairy farms of Delaware County produced the world's finest butter. Skene Memorial Library was founded by Dr. and Mrs. Alexander Skene, a celebrated surgeon and his wife, who were summer residents of Highmount for many years. Construction of the library was made possible with a ,000 grant from Andrew Carnegie. The cornerstone was laid in November 1901. Prior to 1909, the only school was a one-room schoolhouse located on the Old Halcott Road. Increased enrollment made it necessary to add more rooms and eventually necessitated the creation of Griffin-Fleischmann's High School on upper Wagner Avenue. This school served over twenty surrounding districts. After consolidation with Margaretville in the fall of 1969, grades one through four remained in the Fleischmanns building. Declining enrollment in the districts forced the closing of the building in June of 1984. The decline of the Catskill resorts occurred gradually as depressed economic cycles, world wars, and the emergence of affordable air travel all took their toll. The grand hotels were the most vulnerable to economic downturns. In order to shore up revenues, their proprietors advertised special deals through the railroads to attract day visitors for dining, dancing and other diversions. With the advent of the automobile, passenger service on trains declined in the 1920s. Then the Great Depression of 1929 struck, wiping out credit and forcing many hotels, cottages and summer camps to remain closed until the economy bounced back in 1934. In that year, local newspapers reported on the array of entertainers, celebrities, and distinguished persons once again frequenting Fleischmanns. In the mid-1930s, local hotels benefited from the promotion of passenger trains to Phoenicia for skiing; then World War II sent the able-bodied men off to fight. In 1954, the railroad's elimination of passenger service signalled the end of an era. Yet Fleischmanns survived all of these setbacks with many loyal patrons returning year after year. Boarders often developed lasting friendships with local families. The improvement of roads for motor traffic helped to boost tourism, although the southern Catskills of Sullivan County flourished at the expense of accommodations further away. But even those Jewish bastions of luxury and entertainment faltered with the advent of affordable jet travel after World War II. As leisure travelers were lured to Europe and more exotic ports of call, technology revolutionized everyday life. The invention of air conditioning made the City's heat more bearable and television offered entertainment at home. The grand hotels fell into disrepair and many of the boarding houses closed their doors. Although Fleischmanns would continue to offer the greatest number of hotel rooms in Delaware County, it would have to reinvent itself to survive. Over a period of ten years, a rash of hotel fires signaled the end of these ghostly relics of a gilded past. Only a few faded beauties remain today, among them the Palace, the St. Regis, and the Linden Hill. At the advent of a new millennium, Fleischmanns and other watershed villages have organized task forces to articulate their visions for the future. Never before have environmental concerns been so linked to development. Never before has the need to chart a viable economic future been so pressing. Of all the watershed villages, Fleischmanns has one of the grandest histories. Caring citizens have made an effort to keep this history alive through the Greater Fleischmanns Museum of Memories, Skene Memorial Library, historic markers, and voluntary restoration of facades on Main Street. Wagner Avenue has retained its legacy of fine Victorian homes. The town's character makes it a choice location for film shoots and many local residents appeared as extras in The Tears of Julian Po. All across America, heritage tourism has become a major component of the tourism industry, and many towns and villages have successfully resurrected their past through landmark restoration, museums, visitor centers, and festivals. Now, the Catskill Watershed Corporation poses a unique opportunity to undertake such projects locally, supported by development funds, small business loans, a tourism budget for promotion of the Catskills, and an integrated regional economic plan. New resort development is part of the equation, but villagers do not want to see their surroundings turned into a theme park. The dignity and the rugged beauty of the Catskills remains, a beauty that has endured. The Catskill Center for Conservation and Development is integral to an organized movement to support sustainable development while conserving the regions bountiful natural resources. While some fields and pasture land are returning to forest, others are being farmed for specialty crops. The sale of Catskill regional specialty foods and produce is becoming a million-dollar plus industry. Through the Watershed Agricultural Program, dairy and produce farms are serving as a national model for protection of water quality. As urban sprawl encroaches upon counties closer to New York City, urbanites are demonstrating a willingness to travel further to reach unspoiled scenic areas. This bodes well for Fleischmanns and other villages now protected within the Watershed by virtue of their location. Already, many second-home owners have invested in the area, bringing new shops and services. In Fleischmanns, a string of antique shops and the Purple Mountain Press on Main Street keep company with a new computer education center. Roberts Auction is a Saturday night staple, where village notables can be spotted in the crowd. Change is inevitable; we all share responsibility for its direction. The future is in our hands. Return to Home Page of Skene Memorial Library.